WELCOME to the Stop Hunger and Poverty Now website. We hope you will find this site interesting, informative AND inspiring. This 22-year-old ministry is active in helping migrant workers in the numerous camps scattered throughout Washington County west and southwest of Portland, Oregon. Stop Hunger and Poverty Now (SHPN for short) is a dynamic outreach to these people who form the backbone of our agricultural industry, but who live in desperately poor conditions. It was founded by Dennis and Charlotte Bischoff of Sherwood, Oregon in 1988. Moved by the suffering of the Ethiopian famine, they wanted to make a difference to the lives of disadvantaged people in a tangible way. 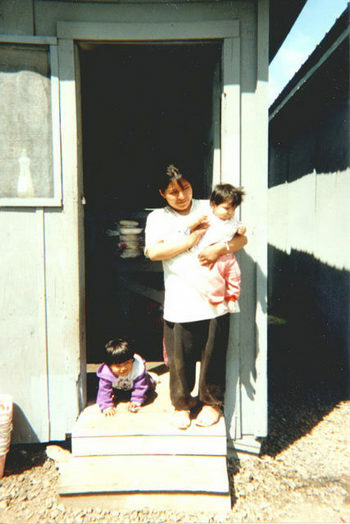 The Lord led them to start SHPN, to reach out to the poorest people in Oregon. 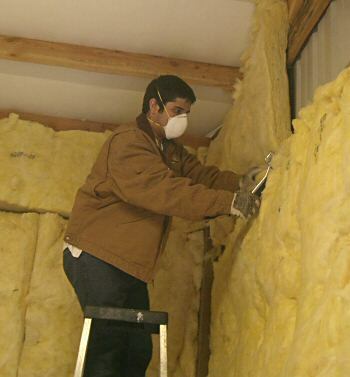 Thanks to generous donations of and for materials and labor, the warehouse is getting much-needed insulation for 2010! The fields are "white for the harvest,"
We take food, clothing, useful implements, and the good news of Jesus Christ to these camps every year, from around April to September during the growing season when the camps are occupied. We have formed many lasting friendships with these individuals - men, women and children. On this site, I hope to acquaint you with them, with their lives and needs and how you might be able to make a positive difference even from a distance to empower them through this ministry. I will post our newsletters, and information on associated ministries that are developing through SHPN. God bless you in His Son! We are privileged to be serving those who form the backbone of our food industry - the men, women, and children who do the hard work of manually harvesting the grains, fruits and vegetables that come to our plate via the grocer. Without them - in fact, without their consistent dedication year in and out - you and I would suffer. However, these same individuals suffer from low wages, lack of health insurance, and abysmal conditions in many of the migrant camps. They come from Mexico, Central America, even parts of South America. They come to the United States hoping for opportunity, to earn a bit more and send it back to support their relatives at home. Many of them are actually descended from Native tribes, and some may not be able to read Spanish, much less English. They are a sweet and kind people, almost without exception, with strong family values. A large percentage have been exposed to Catholicism, often mixed with spiritism, shamanism, and animism. Every year, many will travel a circuitous route from California to Oregon to Washington, then back, following the various harvests of field and orchard. Some stay and put down roots, finding local jobs. Some return south of the border and do not return. Some take what they have found here - the Good News of Jesus Christ - and start churches back in Mexico. In one case, a church has grown rapidly down in Oaxacha, perhaps the poorest state in Mexico, from 16 to 65 in a short time. SHPN is now assisting them to build a larger church meeting place for their growing ministry. A man in one of the migrant camps served by SHPN some years ago was burdened by alcoholism. He met Jesus Christ and has become a minister of the Gospel. These people's hearts are open. They gladly receive Scriptures in their own language, and many have received the Lord over the years - men, women and children. You shall not pervert the judgment of your poor in his cause (Exodus 23:6). For the poor shall never cease out of the land. Therefore, I command you saying, You shall open your hand wide to your brother, to your poor, and to your needy, in your land (Deut. 15:11). He shall have pity on the poor and needy and shall save the souls of the needy (Psalms 72:13). But He raises up the poor from affliction and sets families like a flock (Ps. 107:41). Whoever scorns the poor reviles his Maker; he who is glad at calamities shall not be unpunished (Proverbs 17:5). He who has pity upon the poor lends to the Lord, and He will pay back what he has given (Proverbs 19:17). Is not this the fast that I have chosen? To loose the bonds of wickedness, to undo the heavy burdens, to let the oppressed go free, and that you break every yoke? Is it not to share your bread with the hungry, and that you bring to your house the poor who are cast out; when you see the naked, that you cover him, and not hide yourself from your own flesh? Then your light shall break forth like the morning, your healing shall spring forth speedily (Isaiah 58:6-8). He has shown you, O man, what is good. And what does the Lord require of you, but to do justice, love kindness, and walk humbly with your God? (Micah 6:8). Then the righteous will answer Him, saying, "Lord, when did we see You hungry and feed You, or thirsty and give You drink? When did we see You a stranger and take You in, or naked and clothe You? Or when did we see You sick, or in prison, and come to You?" And the King will answer and say to them, "Assuredly, I say to you, inasmuch as you did it to one of the least of these My brethren, you did it to Me" (Matthew 25:37-40). "You shall love the Lord your God with all your heart, with all your soul, with all your strength, and with all your mind, and your neighbor as yourself" (Luke 10:27; and Leviticus 19:18). Thanks to the Lord Jesus Christ, and his Holy Spirit working through over 488 volunteers from 15 churches, we can tell you MUCH has been done! Over 1200 people - men, women and children - have come to salvation in Christ Jesus! Over 2000 Spanish Bibles and New Testaments have been given out. Over 14,000 people in nine camps have been ministered to over the years. 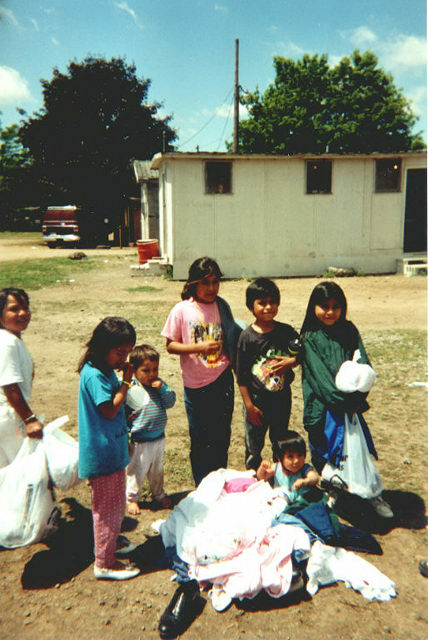 Over 180,000 pounds (90 tons) of food and clothing have been distributed to these families. Vacation Bible School has been held during most of the past ten years, sometimes several times in a summer, for the children. An Annual Holiday Banquet has been held in Sherwood, Oregon for the poor - many of them from the migrant camps - for nine years. This has included a full Thanksgiving meal, music in English and Spanish, a gospel message, a Christian muppet show from the youth group at Rolling Hills Church in Tualatin, and a pinata. Most years, the children have received gifts. A number of people have come to Christ through this ministry as well. A 1200 square-foot warehouse has been completed in 2004 on the Bischof's property to store food and clothing through the winter and year-round. This has ministered to many poor families in the area. Any spare food from the camps has been placed in food baskets and distributed to the poor in downtown Portland (street people included) and other areas. "If you have faith like a grain of mustard seed, you shall say to this mountain, 'move from here to there'. And it shall move. And nothing shall be impossible to you." Since the Creator of the Universe has stated this, it behooves us to think big. Specifically, to think HIS thoughts. We pray for Christ's vision, since He's in charge. Most of all, for more people to come to Christ Jesus as their Savior and Lord. Secondly, to find enough Christian volunteers who speak Spanish to permit some consistent, week-by-week discipling in the Word and in the Christian Life. More volunteers and more interpreters as we go to the camps each year, to permit more people to hear the Good News, at more camps (so far, we have primarily ministered at only nine of the 27 or more in Washington County). Expansion of the warehouse for food, clothing and other implements. Building of some skill-training opportunities through the warehouse to teach job skills. There are many more areas the Lord may intend, and we ask your prayers to know where to invest time, love, and energy - following His lead at all times. May God bless you all in the year ahead, and annoint you for His work! I just had the privilege of sharing a marvelous evening with other volunteers at one of the migrant camps that Stop Hunger and Poverty ministers to. As our caravan of cars pulled into the dusty camp, sporting its group of dilapidated trailers, a troop of beautiful children came running out to meet us, sporting wonderful smiles. "Where's the clown? (payaso in Spanish)" one of them asked. I told them the clown was among us and would be ready soon. The children wanted to know what my name was, and I theirs. Among some others with more typical Spanish names, one six-year-old boy, Charlie, said he had two brothers and a sister, and that their family was going back to Mexico for Christmas. I greeted some of the other volunteers - Ramon, an evangelist; Julie, who partners in ministry with him to the camps; Harry, a long-time SHPN volunteer who has a strong intercessory prayer ministry; Two of the women volunteers began to organize the children and soon they were singing some beautiful spanish worship songs, such as "Tengo un amigo que me ama" (I have a Friend who loves me) with one of the musicians, Melchor, accompanying on an acoustic guitar. Noticing some of the adult men off by the trailers, I approached a group of them and asked one his name, introducing myself - "Como se llama?" He answered, "Pedro". I then pulled out a pocket Spanish New Testament and asked if he could read in Spanish, since many of the migrant workers cannot. He said he could, and I gently walked with him through a group of verses in the back of the small Testament that shared about how God loves us and sent His Son Jesus that those who believe on Him could have eternal life. We read about how all people have sinned, everyone, and that the penalty of that is death - spiritual, eternal death. Then came the verses about how God made provision for that problem - not demanding our own perfection, but by giving His perfect Son as the payment for our sin on the Cross. We need only reach out and invite Jesus into our hearts. Together, we prayed a prayer asking Jesus to forgive our sin, and Pedro invited Jesus into his heart. I gave him the New Testament and encouraged him to read a little every day - stating it was "comido para corazon" (food for the heart). By this time, food was being distributed to every trailer - a frozen chicken, bags of beans and rice, and cooking oil. Clothing would come later. I shared with some additional men, as did Ramon, and altogether six men received the Lord into their hearts. Ramon asked me to join him to share with one young woman who said her father was a minister, still in Mexico. After we shared the gospel with her, she stated she "didn't know" if she wanted to receive Jesus. I showed her an index in the front of the Spanish testament that could point her to verses for when one is anxious, depressed, going through difficulties, etc - and gave her the Testament as she began to show interest. After encouraging her again that there could be no downside and only a wonderful upside to accepting Jesus into her heart, and that we aren't asked to be perfect, only to freely reach out and receive the gift, I left her in God's hands. SHPN would like to give thanks for our volunteers, who have numbered over 400 during the 22 years since we began. We deeply appreciate our core volunteers for their diligence, compassion, and consistency in ministering in the migrant camps. Two of our group are featured in this post, and more will be described in future posts. Ramon is the Hispanic Team leader, and a very active evangelist. He visits the camps seven days a week - except when he is in church himself - sharing the good news about Jesus Christ and His paying the penalty for our sins. Ramon came to Jesus about five years ago. He explained to me that his mother, who lives in Mexico, has the gift of prophecy and prophecied over him when he came to the US. He first attended church in Cornelius, then joined a Four Square church with whom he actively ministered and evangelized to the Portland homeless under the Burnside Bridge for two years. 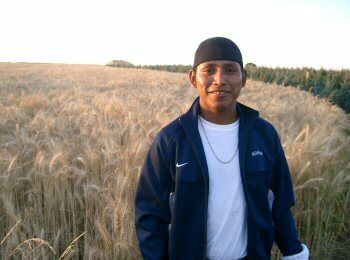 About four years ago, a friend invited him to come out to one of the Scholls area migrant camps. He began sharing the gospel with families there. As time passed, he felt led by the Holy Spirit to continue ministering more and more in this and the other migrant camps. He found the people very open to the gospel. Now, he ministers at eight camps in the Scholls area and recently began to visit five camps up in the Woodland, Washington area, as well as one at Fairview, Oregon. He is currently attending Iglesia Hispana Liberacion. He and his co-minister, Julie Alvino, are active with follow up and discipleship in addition to providing prayer counsel and practical help for the people in the camp. 135 people came to the Lord through their and other efforts in the camps this past year! Ramon is heavily involved in discipling new Christians in the camps, also. Julie is very active sharing the gospel with Ramon, six days of every week evangelizing in the migrant camps. She works together with Ramon in eight camps in the Scholls area and more recently five camps up in the Woodland, Washington area as well as two camps in Fairview and Sandy, Oregon. Julie gave her life to the Lord in 1986. 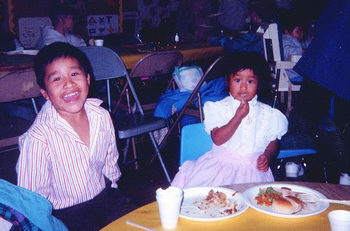 She gained an appreciation for the Hispanic culture when she first began to study Spanish in school. This appreciation grew into a love of the people as God changed her heart. Serving in the migrant camps is a direct expression of that love. Her first experience in the camps came through the invitation of Ramon, and she has been in the ministry for three years now. She has been teaching English to the people in the camps as part of the ministry. Julie explained to me that many of the people speak Spanish as a second language and some do not speak Spanish at all. 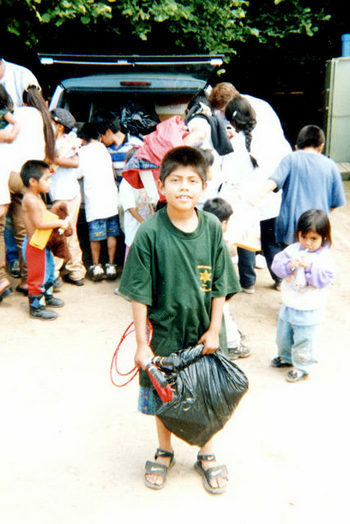 The people in the camps are primarily the indigenous peoples of Mexico and Guatemala. Many speak Trique and Mixteco dialects.